I was first made familiar with Yoshikawa’s meticulous work during my period of obsession with Toyota’s 2000GT. As a young man I was enamored with the work and history of Carroll Shelby, which led me to the Toyota sports car. Yoshikawa literally wrote the book that defined the history of the 2000GT, and I saved my rare-gotten pennies to buy a copy of the $300 tome. He was once the premier metal fabricator for 2000GT restorations, but has discontinued the practice with age. 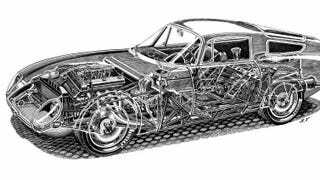 From there, in doing a bit more research, I saw that he had dozens of perfectly rendered car cutaways showing the perfect delicate detail with which cars were once built. If you have any kind of affinity for the mechanical componentry found within the fenders of a car, you’ll likely have the same kind of appreciation for cutaway art. It isn’t exactly easy to come across a Ferrari GTO, they’re a bit thin on the ground. Most people won’t ever get the opportunity to poke around inside one, and even if you see one it’s not easy to gain audience with the greasy bits underneath the pretty outer candy coating. But with one of these cutaway drawings, you can see how the pieces of the puzzle fit together. I was lucky enough to meet Shin during a trip to the Monterey Motorsports Reunion at Laguna Seca during Car Week a few years ago. He had a booth in the vendor area, and I hadn’t intended to purchase a giant poster that day, nor did I have any practical way to carry it, but when the opportunity presented itself, I couldn’t walk away empty handed. I unfurled a Porsche 904 cutaway from his stack of awesome and had him sign his name to it. He was quiet and gracious, and thanked me for supporting his work. It remains one of my prized pieces of automotive memorabilia. These posters are incredible, and at $40 for a print, they’re a small pittance compared to the months of ink work each took to produce. If you’re so inclined, go check out the myriad different cars he’s drawn over the years, and maybe pick one up.